Canada’s young Afiara string quartet kicked off a six-concert Beethoven marathon tonight with plenty of enthusiasm. It’ll be the first time in over a decade that Ludwig’s string quartets will be performed as a complete cycle in Montreal. 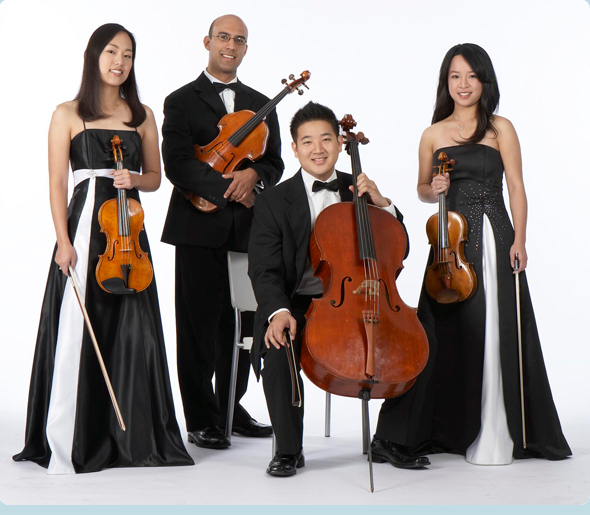 Next week, Afiara will pass the baton to an ensemble of an earlier generation—the venerable Tokyo String Quartet, highly acclaimed as some of the top string players worldwide. Then, the Chiara String Quartet, Harvard’s new quartet-in-residence. Some say the Beethoven string quartets changed the whole face of music. Most of them were premiered in a series of concerts put together by violinist Ignaz Schuppanzi and his quartet, one of the first performance series featuring a professional chamber music ensemble playing to a paying audience and, at the time, the only one featuring instrumental music exclusively in Vienna. This, at a time when chamber music was generally thought of as a recreational home activity; early 19th century Monopoly, if you will. Those concerts were prototypes of music concerts as we know them today—consumer activities where audiences look forward to being wowed by what those at the top of their field choose to present. Afiara has a bit of a specialty when it comes to Beethoven; they took home the Szekely Prize for the best Beethoven performance at the Banff International String Quartet Competition last year. For players in their 20s and 30s they showed maturity in their performance at St. George’s Church. They carried off the dramatically long stretches of silence in the String Quartet #1’s second movement very well. It’s a movement supposedly inspired by the fateful crypt scene in Shakespeare’s Romeo and Juliet. The more-classical feeling Quartet #1 was followed by the fully Romantic Quartet #11 “Serioso,” a sort of test lab piece preceding the famed late string quartets. It was good programming to balance the opening show in the series with a piece each from the early, middle, and late string quartets. Chamber music is a medium of choreographed conversation, and nowhere was that more apparent tonight than in the beautiful, long third movement of the concert-closing Quartet #15. The movement’s slightly religious feel had a magical effect in the dark church, and the intonation problems the players had occasionally suffered from in the two previous pieces seemed to all-but disappear. It was no doubt this virtuosic 15th quartet that most of the audience had in mind during the standing ovation. The thirteen other quartets take their turn in the spotlight tomorrow and Tuesday-Wednesday over the next two weeks. For classical music lovers, it’s a marathon of canonical and beloved pieces not to be missed. The “late string quartets”—the last six, and the last pieces Beethoven ever composed—are especially innovative (correspondingly, some note, to the progression of Beethoven’s loss of hearing) and relentlessly hard for performers. They also appalled critics of the time. As good a measure as any by which to tell you’re in for a real mind-opener.